It was a most satisfactory showing, even if I didn't win anything. My Beowulf-with-lyre went splendidly. I realized on Friday, in the car, that I actually could get through my entire selection confidently, even if perhaps some of the words were not spot-on. In performance, I made two errors - flipped some words around in one case (minor, and I didn't even blink as I covered) and a worse one where what was supposed to be a sentence came out as a random clause. I didn't try to fix it and just bulled on. Woo! Judging sheets were uniformly positive. All told, that's very much the sort of thing I've been driving toward since 2007 or so. I was selected to proceed to the final round - there were only three of us, and everyone was fantastic in different ways. Don't envy the judges their decision. I performed my piece I wrote for the event, "I Drank of Mnemosyne," the music for which was composed on-site and which I still didn't have solid as I performed it. Considering that it was essentially improv? I'm pretty dang pleased. Better, at least two gentles complimented me afterwards on the impact of the lyrics. Lord Ulfarr from Stierback won the chalice of chocolate for his song remembering his first Pennsic - it was far more polished than mine, with a MUCH more interesting melody, and he sang it exceedingly well. Kudos! Similarly, the banner did not win in A&S, but the woodcut that did TOTALLY deserved it. It was fabulous. The feedback for the banner was positive, ranging from "somewhat above average" to "well above average." For the first time possibly ever, my documentation was ranked consistently lower than my craftsmanship! Considering that this is the first embroidery I've done since... college? Twenty years ago? and the first time I've ever done couching at all, I'm pretty pleased with that. Also, the banner rocks, and I'm pleased to have made it. The hang-up on the documentation and authenticity seemed to be (if I can judge the few sentences of feedback) whether or not my goldworked banner was appropriate, or if it should have been made of humbler wool. That's fair - I used Beowulf as my basis for making a golden standard as a status object, since so many of the other gift-objects in Beowulf have direct evidence as archaeological finds as well. But, like the heralds say not to use fiction to source your name, one could argue that this wasn't the strongest basis for an artifact. My seven-year old had a pretty good time of it, except for during the bardic round one, which was unimaginable boring torture for him. Ponte Alto has a great basket of toys and a small wooden castle which amused him for literally hours, and he played a bit with some other kids. We had an emergency iPad tucked away in case of critical boredom, but we didn't have to get it out. Hurrah! Ages ago, I had this idea that, to sing/chant alliterative poetry, one should assign fixed tones to the stressed syllables, and then fill in the other syllables as needed. Yesterday in the car, I was trying it out. At a first go, it's really really hard to let go of years and years of singing one way and suddenly sing another. Then I thought: What if... 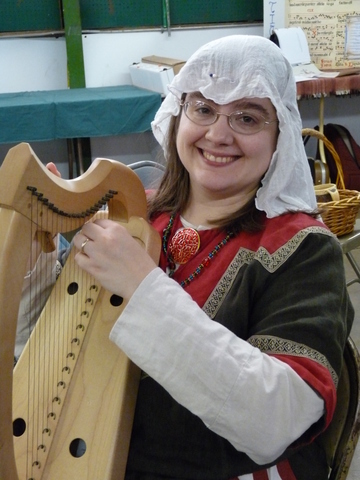 I played the 'stress notes' on the lyre or harp, and sang the others? Dividing the work between hands and voice might help maintain the separation between the fixed pattern and the changing ornamentation - sort of like the principle behind playing guitar chords, I guess. Wow, okay, it sounds a lot less novel when I put it like that. Heh. Still, that's similar enough to some of the kinds of improvisation that I have done that I think I might be able to get it to work. Will have to try soon! I'm currently in New Orleans. Last night, I wandered past a music store in which a jazz band was playing, and I paused to have a listen. The basic tune was "The Man on the Flying Trapeze." While the bass and the piano kept up the chord progression, and the drums kept tempo, the sax, the trumpet, the clarinet, and the trombone all took turns riffing on it - and at one point, the piano had a go, too. The other melody instruments were quiet as the soloists did their improvs. Then everybody came back together for the finale - I'm not sure how many of the riffs and ornaments there were rehearsed, and how many were spontaneous, but it was a glorious riot of sound. They did another piece, the melody I didn't recognize, and even the bass got to take a turn soloing. It was the same format - everyone played together to open the piece, then each took a turn as a soloist, and then they came back together to finish it. It took me a while to figure out what the melody was in the first case - I'd heard snatches of a tune that was familiar, but then the riffs would carry it off someplace and I couldn't fix it in my head. It was very interesting to hear how the improvisation was clearly based around the tune, yet also very free in wandering away from it. That is something that would be good to learn how to do, even if the exact technique in "wandering" should be different for a modern medieval musician than for a jazz man.